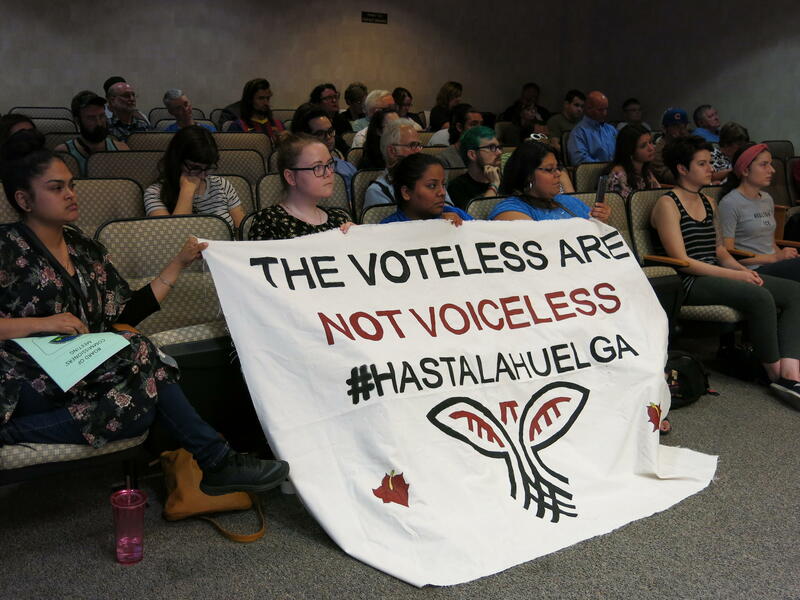 Supporters of immigrants' rights held a banner on Tuesday as Kalamazoo County commissioners discussed a resolution on family separations. Kalamazoo is joining Ingham and Wayne counties in officially declining to detain undocumented immigrants on behalf of the federal government. On Wednesday, Kalamazoo county commissioners passed a resolution against the separation of immigrant families, and against putting county resources toward federal immigration policy enforcement. An amendment made shortly before the vote effectively stops the county from granting so-called ICE detainers. Those are requests from federal Immigration and Customs Enforcement for local police and sheriffs to hold a person who’s been arrested, even when they’re due for release. Attorney Jessica Glynn spoke to the board before the vote, and before the amendment was added that targets ICE detainers. She said the threat of detention discourages victims of domestic violence and human trafficking from coming forward. “These policies of cooperating with Immigration and Customs Enforcement at the county level really undermine the justice system,” she said. Kalamazoo County Sheriff Rick Fuller also spoke before the vote. Fuller told the board that his department will continue to work with Immigration and Customs Enforcement and other federal agencies on criminal investigations. But the sheriff told the board he was “comfortable” with the amendment against detention requests. “We’ve been working on a written directive for the sheriff’s office for a good amount of time here. This is in line with what we’re working on,” he said. The resolution passed 7 to 3, with six Democrats and one Republican voting in favor.